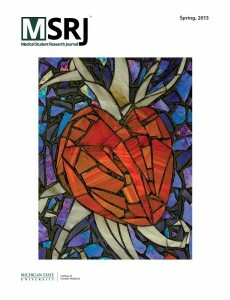 After much anticipation our latest issue, Volume 2 – Spring 2013 has now been published! In this second issue for this year, there are articles from Tulane University SoM, American University of the Caribbean SoM, and Michigan State University’s College of Human Medicine. Letter From the Editors. Chad Klochko M.S. It has been a pleasure to work as an editor over the past year. I believe that this can be a significant outlet for medical students to publish their research work, enabling them to receive credit for publishing, but even more importantly, contributing to the general body of medical knowledge and teaching valuable academic skills. Download here. All Heart. Brittney M. Benjamin. There has been a trend to portray doctors as “all” - all knowing, all thinking, all seeing, all doing. We’re all brains, learning and memorizing, and all hands, cutting and suturing. Doctors can be any or none of these things, but sometimes we miss our greatest strength: we can be all Heart. And by being all Heart, we must be careful how our experiences affect us. Download here. A comprehensive stroke center patient registry: advantages, limitations, and lessons learned. James E. Siegler, Amelia K. Boehme, Adrianne M. Dorsey, Dominique J. Monlezun, Alex J. George, Amir Shaban, H. Jeremy Bockckholt, Karen C. Albright, Sheryl Martin-Schild. The use of a medical data registry allows institutions to effectively manage information for many different investigations related to the registry, as well as evaluate patient’s trends over time, with the ultimate goal of recognizing trends that may improve outcomes in a particular patient population. The purpose of this article is to illustrate our experience with a stroke patient registry at a comprehensive stroke center and highlight advantages, disadvantages, and lessons learned in the process of designing, implementing, and maintaining a stroke registry. Download here. Potential pathogen transmission on medical student anatomy laboratory clothing. Chandan J. Kabadi, Carroll R. Smith III, Fernando Gomez. In our study, we aim to determine if the setting of an open cadaver laboratory was conducive to the transmission of pathogens such as Staphylococcus aureus, Streptococcus pyogenes, and Enterococcus faecalis. From these results, we conclude that stronger infection control measures are warranted to prevent the occurrence of unnecessary disease transmission in this setting. Our study provides data that support further investigation of potential pathogen transmission by student laboratory clothing and supports the use of universal infection control procedures to provide safer environments for medical students and their contacts, including laundering protocols for coats. Download here. Funding the Future. David L. Ortiz. The problems facing healthcare training today are not simple. Predictions about future demand for physicians have a poor track record, as the GMENAC studies of the 1980s showed. Even if one could predict perfectly the demand for physicians in the future, history has shown that it takes 10-40 years for the full effects of increased medical school enrollment to be felt. The rate of GME must rise. In its present state, GME could sustain reductions as great as 10% of funding without the loss of total residency slots, but any decrease in GME funding will undoubtedly perpetuate the inadequacy of the physician workforce. By 2016, without increased GME funding, there will be a substantial increase in the number of unmatched US seniors and a substantial decrease in the number of foreign medical grads. Download here. Benjamin BM. All Heart. Medical Student Research Journal. 2013;2(Spring):20. Siegler JE, Boehme AK, Dorsey AM, Monlezun DJ, George AJ, Shaban A, Bockckholt HJ, Albright KC, Martin-Schild S. A Comprehensive Stroke Center Patient Registry: Advantages, Limitations, and Lessons Learned. Medical Student Research Journal. 2013;2(Spring):21-29. Kabadi CJ, Smith III CR, Gomez F. Potential Pathogen Transmission on Medical Student Anatomy Laboratory Clothing. Medical Student Research Journal. 2013;2(Spring):30-35. Ortiz DL. Funding the Future. Medical Student Research Journal. 2013;2(Spring):36-39.